The No.16/No. 18 UCLA Bruins (6-1) take on the No.17/No. 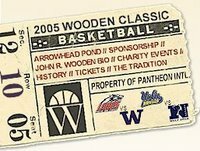 22 Nevada Wolf Pack (5-0) in the 12th Annual John R. Wooden Classic at the Arrowhead Pond on Saturday, Dec.10 at 2:30 PM (PT). It will be UCLA's 9th appearance in the Wooden Classic where the Bruins hold an overall 5-3 record. In last year's game the Bruins lost to Boston College 74-64. The Wolf Pack are undefeated at 5-0 and recently beat Kansas in Lawrence 72-70. They are led in scoring and rebounding by a pair of excellent forwards: Nick Fazekas and Mo Charlo. 2005 WAC player of the year junior forward Nick Fazekas (6'11 230) averages 22.4 points and 8.8 rebounds a game. He has a good low post game and can step out to hit the mid-long range jumper. Fazekas scored 35 points to key the Wolf Pack victory over Kansas. Mo Charlo a 6'7 senior slashing forward (15.2 ppg 7.6 rpg) can get to the basket and finish or end up at the foul line. He went 11-11 from the line against Pacfic last weekend. Charlo is also the Wolf Pack's most tenacious defender. Nevada also gets good scoring from 6'5 sophomore guard Marcelus Kemp who is the second leading scorer on the team (16.6 ppg). The Wolf Pack have a tough defense which has allowed only a 39.% FG% in the five games this season; and they have also outrebounded opponents +6.2 on the boards. The Bruins toughest defensive match up will be against high-scoring power forward Nick Fazekas. Most likely the Bruins will start freshman Luc Ricahrd Mbah A Moute (6'7) against Fazekas. Alfred Aboya (6'8), who played 16 minutes in his return to action last week, will also get a turn at him. If Fazekas's size is too much for either Mbah A Moute or Aboya, we may see 7-footer Ryan Hollins match up against Fazekas during the game. Regardless of who will gaurd Fazekas - expect coach Ben Howland to direct his other players on the court to give as much help defense as possible. Although Howland does not like to play zone defense, he will have his Bruin guards and forward sag down to help out the low post defender on Fazekas. The Wolf Pack don't shoot from the outside exceptionally well although they do shoot 39% from the 3-point line, but they don't shoot often from the arc (74 3-point attempts through 5 games while the Bruins have taken 125). The Bruins will have to not only put a stronger defensive effort against a tough Nevada team, but they need to execute much better in their offensive half court sets where they've struggled thus far in the season. With key injuries to players it has been difficult for the team to execute their offense. Michael Fey is doubtful for this game due (ankle) and Josh Shipp will be out for another few weeks. Whether the Bruin half-court offense is clicking or not, expect the Bruins to push the ball up against Nevada at every opportunity for easy transition baskets. The Bruins have a longer bench as they play 9-10 players even with the injuries to the team while Nevada basically plays 6, maybe 7 at times in games. In addition, the Bruins should pressure the Wolf Pack guards up the court to establish a faster tempo for the game. Nevada does not have a dominant backcourt; however the Bruins do with Jordan Farmar and Arron Afflalo. The Bruins must take advantage of their backcourt superiority to balance out the advantage Fazekas gives the Wolf Pack on the front line. The game will be a good test to show how far the Bruin team has progressed this season.